In much of the country, as I’m sure many of you know, this is the time of year when mother turtles are on the move looking for nesting sites. This often involves crossing roads, so keep an eye out and if you see a turtle in the road, please stop and move it aside, if it’s safe for you to do so. Nothing makes me sadder than a dead smashed turtle. Most of the turtles I’ve been seeing (and rescuing) here have been Painted Turtles, but this evening I found a Common Snapping Turtle, Chelydra serpentina, digging a nest at the edge of the driveway. I was on the phone with a friend (hi Michelle! ), and I ended up with my phone in one hand and my camera in the other, trying to get a good photo without disturbing the turtle too much. Not the best spot for a nest, perhaps. However, if I’m very lucky, maybe I’ll get to see some baby snappers eventually! Hi Rebecca! :) Wow. That nest is even closer to the road than I pictured when you described it to me. Poor life choices, mama turtle. Poor. Life. Choices. They are like us, creating babies and praying and trusting in Creation. They too long to continue. May it be so. 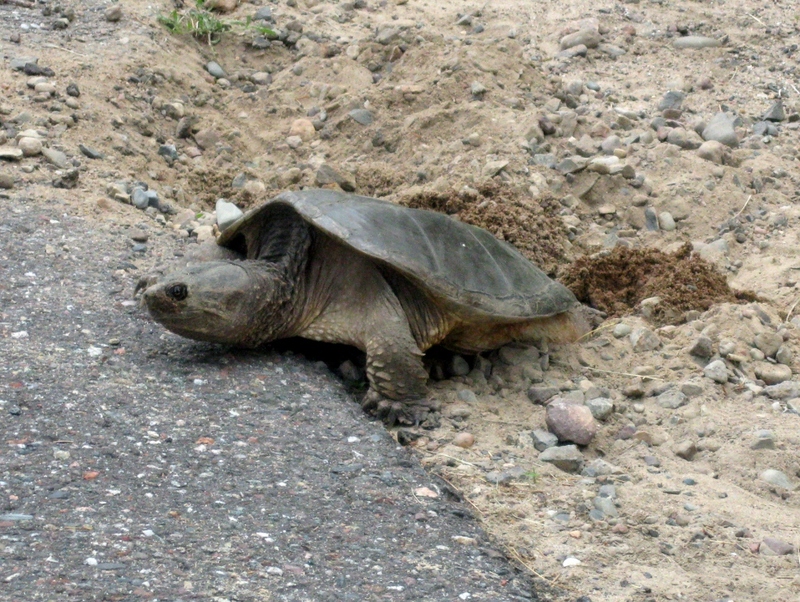 Side of the road nests are sadly popular for turtles who look for soft sandy sunny soils to nest in. Down here in KC I’ve hardly seen any turtle movement, it’s been so dry this spring, they don’t seem to be moving much, even in the woods. Also, and most importantly, don’t think that a dead female turtle is a complete waste! if she is (sadly) freshly dead and you have the fortitude, “extract” the eggs gently (don’t shake or bounce or turn them over), put them in some sphagnum moss/perlelite mixture well soaked, under a nice heat lamp (temp depends on species, but 80 degress-ish), keep humid, and a few months later, you’ll have zombie turtle hatchlings! Last week I moved an eastern long-necked turtle (Chelodina longicollis) off my country road. Unfortunately I didn’t have my camera to get a shot. I think it was moving to its local stream, and there is a road in the way. Next Next post: Dragonflies, Please Sit Still!